After about 15 years working in the meat industry, butcher Brian Kavanagh found he was concealing a secret.Much of his adult life had been spent shaping, slicing and trimming animal products by the slab without a qualm - a career that began when he was just 16 in a small family-run butcher in Burnside, South Lanarkshire.But as he stood silent behind the meat counter in Morrisons supermarket, aged 33, Brian couldn't quite find the words to tell colleagues he had become vegan. "I kept it to myself," he said. "I didn't tell anyone because I was worried about them making jokes. Before I just looked as it as a piece of meat going on a dinner plate but then you see it as an animal and not just a steak. "I was a bit depressed, it just didn't feel good, so I had to leave." 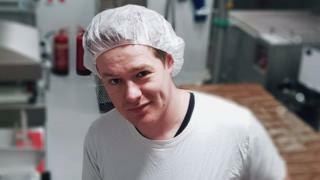 Brian said becoming a butcher was the first job he picked at 16 years old and it was "just something to keep my dad quiet".But he first considered giving up animal products when his wife Rebecca became vegan.It was the animal welfare documentary Earthlings, narrated by Joaquin Phoenix, that finally pushed him to make the change. The award-winning film, directed by Shaun Monson, contains footage of the conditions inside factory farms. Now Brian, his wife and his two children, age nine and six, stick to a plant-based diet.He said that when was working at the butchery counter eating steak or chicken was routine and he would bring meat home every day. "Me and the kids would have separate meals from my wife," he said. "Now it's so much easier doing it together." Brian, who is now 36, gave in his notice at the butcher counter and was eventually hired at the Glasgow base of Sgaia's Vegan Meats, founded by Hilary Masin and Alberto Casotto. "I was worried my background and my story might put them off, and they wouldn't want someone who was a meat butcher for 15 years," he said. "But they were really excited about it and wanted me just as much as I wanted to work there. "He now calls himself a vegan butcher.By blending a combination of soy, gluten and spices, Sgaia's creates a number of vegan products which they call 'mheats' - from staples like streaky bacon and burgers to more specialised foods such as charcuterie.The firm supplies a number of restaurants and kitchens in Glasgow - including the pop-up Durty Vegan Burger Club. The job transition was a worry for Brian but quickly soon after joining he helped to launch one of its most popular products - the vegan lorne sausage.He said: "Making sausages was a big part of being a butcher. Once I saw how the [vegan] base was made I thought it would be interesting to try to play about with that and create a lorne sausage. "All the feedback has been really good. We took it to a festival and some people were coming back two or three times." Recent years have seen a large rise in small food manufacturers marketing their products as a new form of meat, despite resistance around the world. In the US, last week, the governor of South Dakota signed legislation that required "fake meat" products to be appropriately labelled as it "misled" consumers.It came after the US Cattlemen's Association lodged a petition calling for an official definition of "beef" and "meat" in 2018.France has also banned labelling vegan or vegetarian products as a meat item to avoid confusion. But regardless of labels, Brian claimed his own lifestyle changes have brought him nothing but happiness.He said: "My skin was the first thing I noticed. I always had spots until I was 30, but my skin became a lot clearer. I feel clearer in the mind too. "It's that psychological thing - you eat something healthy, you feel good." » Veganuary: What did it cost you?